Les Watkins has served in the construction industry without interruption since three days post high school from Denver Lutheran High School in 1984. I am a graduate of the Carpenters Union four – year apprenticeship program. My first ten years as a carpenter and superintendent primarily with Gerald H. Phipps, Inc. During this time, my experience was primarily building projects ranging from $7M - $52M. I am a true craftsman, and accomplished project manager. After ten years of commercial construction experience I opened LD Watkins Construction Services, Inc in 1993. During my time in business I have completed over 400 projects and one of six general contractors in Grand County remaining since it’s opening in 1993. Through my background we have developed an excellent record of comprehensive challenging construction management projects in a fast paced environment that demands meticulous attention to details, high customer service, and strong project leadership. I specialize in projects that are either crises in nature or craftsmanship driven. Since 1984 I have experienced every kind of construction, but enjoy most, fast paced type projects that demand strong coordination and schedule accountability, and high attention to detail. I am a customer driven contractor and focus our project efforts around the customer needs. I have also served 25 years in the Colorado Air National Guard and currently serving in the highest Air force enlisted rank as a Chief Master Sgt (E-9). Since 2009 I have been involved in the development of a humanitarian project benefiting the disabled population of the Navajo Nation, and the craftsmanship development of Airmen and Navy Seabees. I have provided the design and oversight of this unique project and have served as the customer contact between Washington DC and the Navaho Nation. 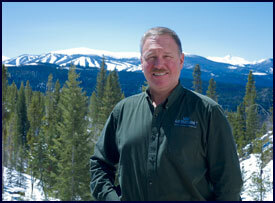 I maintain two office locations for my general contracting firm in Granby and Estes Park, CO. I build and remodel in all of Grand and Jackson County, and the Estes Valley. If you are looking for an experienced builder you can trust, and would like to have fun through the process and have strong oversight and quality control then call us. LD Watkins is an Authorized Independent Representative of Real Log Homes® offering truly custom log home packages with different floor plans to help start the process. LD Watkins is an Authorized Independent Representative of Timberpeg® timber frame homes for mountain environments in northern Colorado. Our homes are custom designed to suit each client and their lifestyle. We listen to our clients' needs and turn ideas into concepts, a plan, and then a home, guiding them through the process every step of the way. LD Watkins belongs to several associations and is part of the Builder 20 Club. Visit the Affiliations section to see the different associations and clubs.